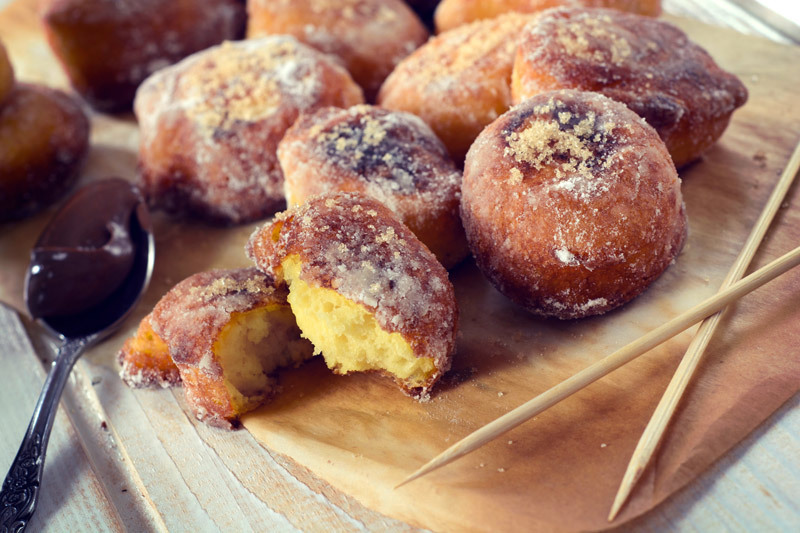 Home-made doughnuts are simple, delicious and easier to make than you may think! Place the milk and butter in a small saucepan and heat gently until the butter has melted. Cool for 5 minutes. Sift the flour into a large bowl and stir in the salt, yeast and 25g of the caster sugar. Pour in the milk mixture and beaten egg and mix to a soft dough. Turn the dough onto a floured surface and knead for 5-6 minutes until smooth and elastic, adding a little more flour if needed. Place the dough in a bowl, cover and leave in a warm place for 1 hour or until doubled in size. Line 2 large baking sheets with baking paper. Knock back the dough and divide and shape into 16 balls. Place, well spaced, on the baking sheets and cover with lightly oiled cling film. Leave in a warm place for 15-20 minutes until puffy. Half fill a large deep pan with vegetable oil and heat to 180°C/350°F, or until a cube of bread dropped in the hot fat browns in 30 seconds. Fry the doughnuts, 4-5 at a time, for 1-2 minutes on each side or until puffed and golden. Remove with a slotted spoon and drain on kitchen paper. Spread the rest of the sugar on a flat plate and roll each hot doughnut in the sugar to coat. Serve warm with chocolate sauce to dip. Feeling jammy? For jam-filled doughnuts, place 3tbsp raspberry jam in a piping bag fitted with a plain nozzle. Insert the tip of a knife into each doughnut and twist to make a hole. Push the tip of the nozzle in the hole and pipe about 1tsp of jam into each doughnut.